SAN DIEGO — “For the Sake of the Children,” a film by Joe Fox and Marlene Shigekawa, will be shown on Sunday, March 3, at 2 p.m. at Ultra Star Theater-Mission Valley, Hazard Center Drive #100 in San Diego. 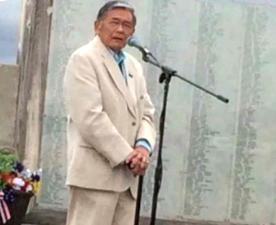 Former Secretary of Transportation Norman Mineta, who was incarcerated at Heart Mountain as a boy, was interviewed for the documentary. Sponsored by the Japanese American Historical Society of San Diego, San Diego JACL, Buddhist Temple of San Diego, and Poston Community Alliance. The screening will be followed by a panel discussion with executive producer Shigekawa and cast members Diana McCabe and Mary Higuchi. Filmmaker Lane Nishikawa will serve as moderator. “With a grant from the National Park Service, Japanese American Confinement Sites Grant Program, we began production with Fly on the Wall Productions in 2012,” said Shigekawa. “Since then we have covered a lot of territory both physically and emotionally. We started uncovering the stories of mothers who gave birth to and raised children while incarcerated and have discovered stories from four generations of descendants. Shigekawa is the author of the children’s book “Blue Jay in the Desert” and “Welcome Home Swallows,” which are about a Japanese American family during and after World War II. Limited seating. Admission free. For more information, visit www.forthesakeofchildren.org.